Ghosts and goulies, blood and gore – and quite a lot of sugar!! October half term and it’s another session for the Sticky Fingers Cookery Club. 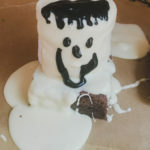 Having decided to run with the Halloween theme, I was spoilt for choice with ideas of things we could make, but I had to limit what we could achieve in the time that we had. Bake a jacket potato in a hot oven for about an hour, an hour and a half, until it is cooked. Remove from the oven and leave to cool slightly to make handling a little easier. Cut the potato in half lengthways and scoop the potato filling into a small bowl. Add diced mozzarella and a drizzle of tomato ketchup and a gentle grinding of salt and pepper. Stir well and put back into the potato skins and add some grated cheese on top. Put back into a hot oven on a baking sheet and cook until the cheese has melted, golden and brown, approximately 20 minutes. 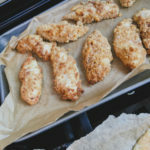 Tasty chicken goujons double up as scary witch's fingers for a Halloween party feast! Empty 2 small bags of Mini Cheddars into a small plastic bag and bash with a rolling pin until you have fine breadcrumbs. Place some seasoned flour in one bowl, a couple of beaten eggs in another and the cheesy crumbs into another – you can add some grated Parmesan cheese to these biscuits for an extra cheesy taste! 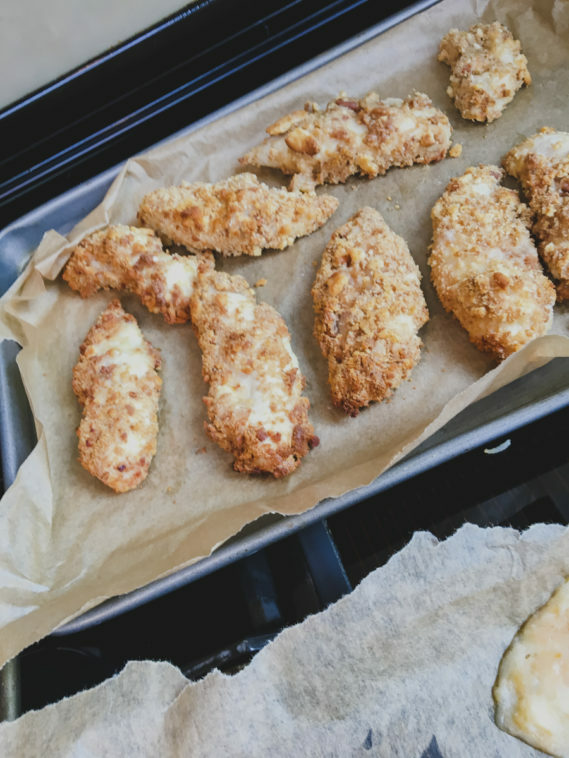 Using your fingers, cover the chicken strips with the flour, then dip into the egg and finally the crumbs, and place these chicken goujons onto a baking tray that has been lined with parchment. Continue until the chicken is all used up – it is very messy but very easy! Cook at around 180C for about 30 minutes and serve with the potatoes!! 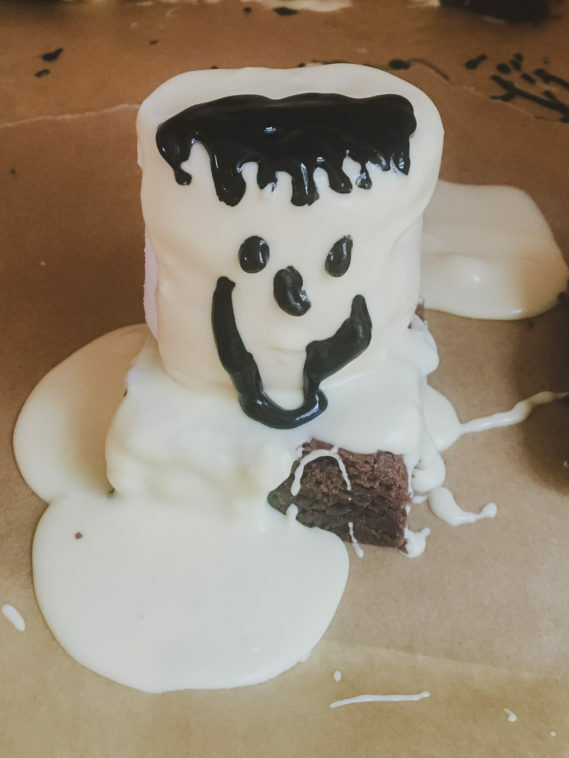 Marshmallows and chocolate brownies, coated with melted white chocolate - far too sweet but gratifyingly spooky!!! For each child, have one average sized chocolate brownie and place an enormous marshmallow on top. Melt a bar of white chocolate in a plastic bowl – we did it in the microwave for about 2 minutes but watch in case it catches and it will go granular in texture! When the chocolate has melted, pour this over the marshmallow, allowing it to drizzle over the brownie. Leave it to set for an hour or so, then decorate with icing tubes in different colours! Marshmallow tip: the American ones are perfect, we found them in Tesco, they are also brilliant for toasting!! 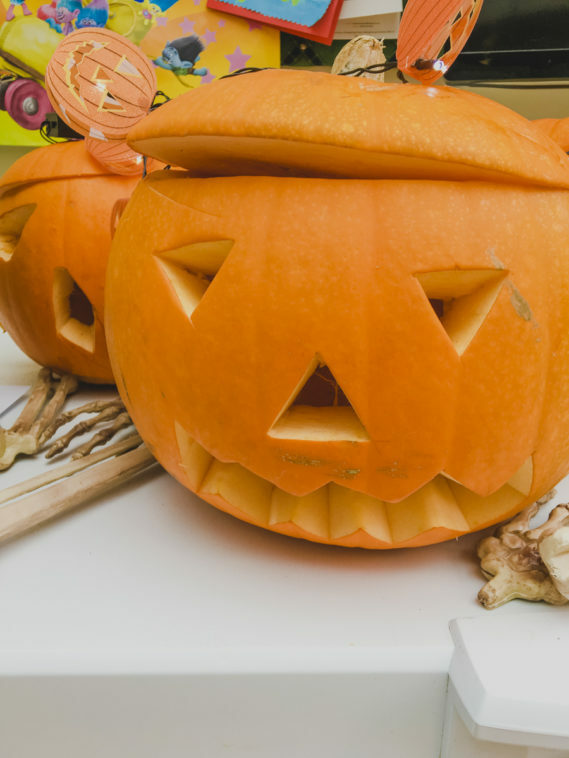 Have a fantastically fearsome Halloween and I hope you have fun giving my Sticky Fingers Cookery School spooky recipes a try!